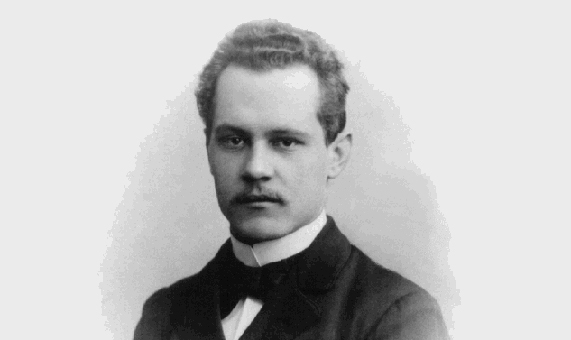 The theoretical physicist Arnold Sommerfeld (1868-1951) was born in Königsberg, a city in what was formerly East Prussia, today Kaliningrad in Russia, and also the birthplace of the mathematicians Christian Goldbach and David Hilbert, the philosopher Immanuel Kant and the writer E. T. A. Hoffmann. After receiving his doctorate from the University of Königsberg in 1891, he moved to the University of Göttingen, the mecca of mathematics in Germany at that time, where he eventually became assistant to the mathematician Felix Klein and gave classes on mathematics and theoretical physics. After spending some years at RWTH Aachen University, in 1906 he succeeded Ludwig Boltzmann as professor of theoretical physics and director of the Institute of Theoretical Physics at the University of Munich, where he set up a school of theoretical physics which gained worldwide renown. Arnold Sommerfeld, who was ten years younger than Max Planck (1858-1947) and a little over ten years older than Albert Einstein (1879-1955), was part of a brilliant generation of German physicists who endured military defeat in the Great War, the fall of the German Empire, the birth of the Weimar republic, Hitler’s arrival in power and the Second World War, but who –in spite of those turbulent years– made a decisive contribution to the birth, development and consolidation of quantum physics. Sommerfeld made major contributions to the field of mathematical diffraction theory, although his most important legacy is what is known as Sommerfeld’s atomic model. In 1915, Sommerfeld developed his own version of Niels Bohr’s atomic model (published two years earlier). Although Bohr’s model worked for the hydrogen atom –that is, an atom with a single electron– it was unable to explain the behavior of atoms with more than one electron. 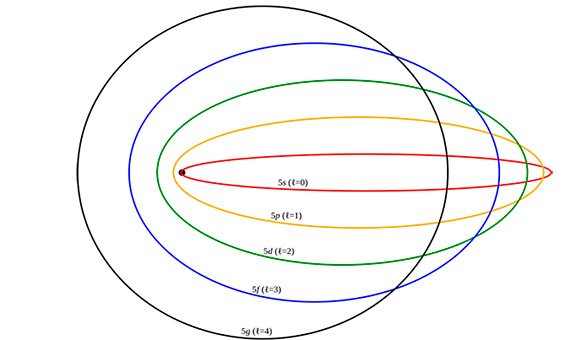 To resolve this situation, Sommerfeld considered elliptical orbits as well as the circular orbits in Bohr’s model, and took account of the fact that in some atoms the electrons moved at relativist speeds. Sommerfeld’s atomic model, a generalization of Bohr’s model, combined concepts of classical physics and Planck’s quantum theory, and was one of the most important consequences of the “old quantum theory”. One of Sommerfeld’s most spectacular successes was his study of hydrogen-like atoms within the framework of the theory of special relativity, which offered a theoretical explanation of the fine structure of the hydrogen atom. In 1916 he introduced the fine-structure constant ( a = 1/137), as a relativist measure of the deviations in the spectral lines of atoms in the predictions made by Bohr’s model, but which over the years became used to characterize the force of the electromagnetic interaction between charged elementary particles in quantum electrodynamics. Sommerfeld’s model (or Bohr-Sommerfeld’s model) remained valid until the advent of quantum mechanics which started to unfold in around 1920, thanks to the contribution of established physicists like Schrödinger and Born, and of other younger physicists such as Dirac, de Broglie, Pauli, Heisenberg, and others). Schrödinger’s wave equation and the probabilistic interpretation of Born’s wave function marked the definitive retirement of Bohr-Sommerfeld’s atomic model, in spite of its success in describing the spectrum of the hydrogen atom. He is the physicist with highest number of doctoral students who were awarded a Nobel prize, namely four (Werner Heisenberg, Wolfgang Pauli, Peter Debye and Hans Bethe). He received the most nominations for the Nobel Prize in Physics, specifically 84 between 1917 and 1951 (more than any other physicist, including Otto Stern, who comes second with 82 nominations, but who was eventually awarded the prize). In 1929 he received nine nominations, including those of three Nobel Prize winners in Physics: Max Planck, James Franck and Max von Laue. 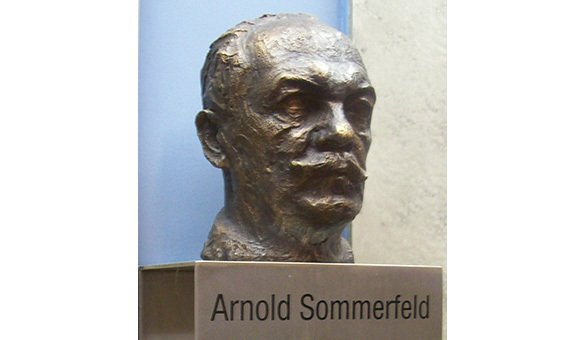 Even in the year of his death, Sommerfeld (with four more nominations) was again nominated for the Nobel Prize in Physics. This would be the last time. Eckert, M.; Arnold Sommerfeld: Science, Life and Turbulent Times 1868-1951 (Springer, New York, 2013). Sánchez Ron, J. M.; Historia de la Física Cuántica I. El período fundacional (1860–1926) (Crítica, Barcelona, 2001). Sommerfeld, A.; “Some Reminiscences of My Teaching Career”, American Journal of Physics, vol. 17, pp. 315-316 (1949). Azcárraga, A.; En torno a Einstein, su ciencia y su tiempo (Publicaciones de la Universidad de Valencia, 2007). “Nomination Database”. Nobelprize.org. Nobel Media AB 2014. Web. 3 July 2017. Arnold Sommerfeld, Wikipedia (consulted July 3 2017). Fine-structure constant, Wikipedia (consulted July 3 2017). André-Marie Ampère, "the Newton of Electricity"